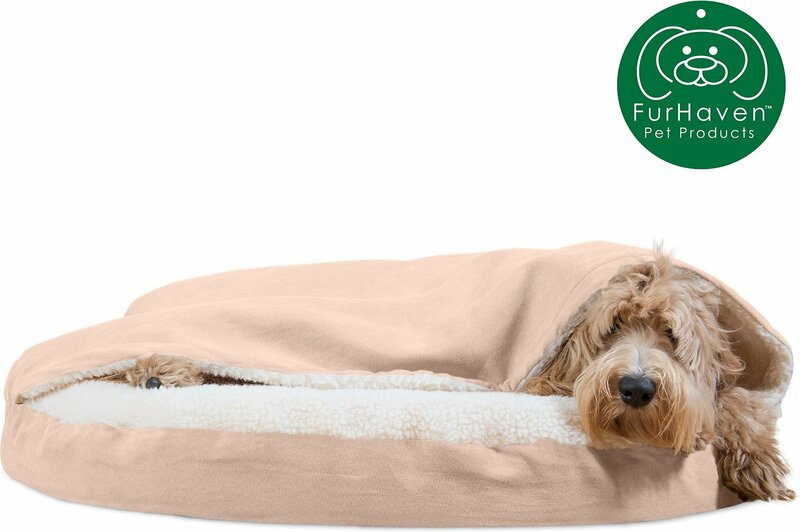 Give your precious snuggly pet a cozy den of her own with the FurHaven Faux Sheepskin Snuggery Orthopedic Dog & Cat Bed. 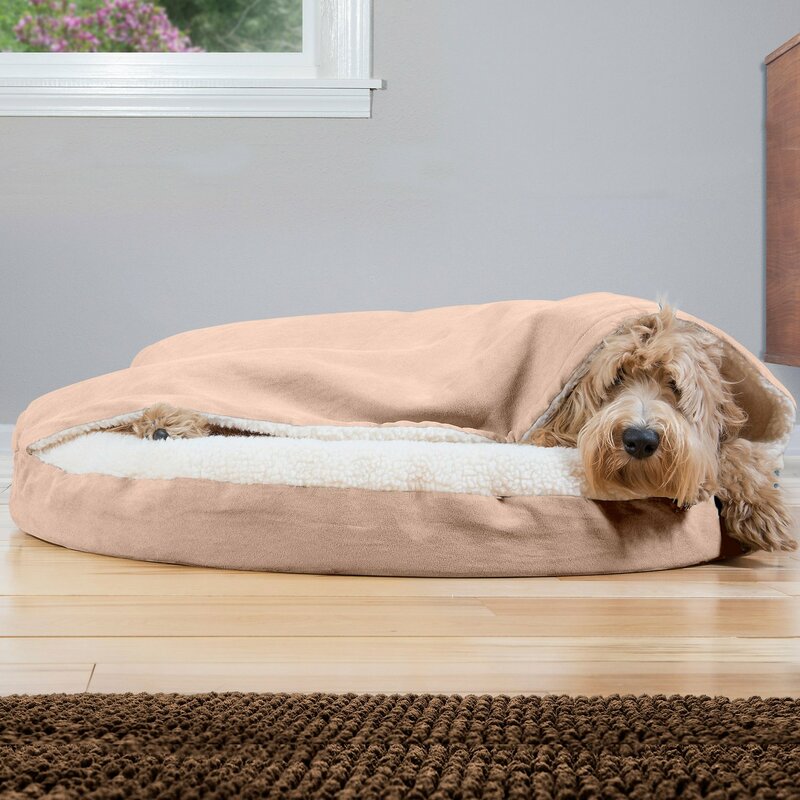 This high-quality, comfortable bed is designed for pets who love to burrow into blankets and other cozy spots. Functioning as a soft, shapeable blanket, the top layer can be used with or without the flexible plastic hoop based on her preferred sleep style and burrowing habits. It’s fully lined in luxurious faux-sheepskin for warmth and comfort, while the solid orthopedic foam mattress supports ideal posture and eases joint comfort. For your convenience, the removable cover zips off easily for care and washing. Top layer functions as a soft, shapeable blanket to provide privacy and security by simulating her natural denning instinct. Luxurious faux-sheepskin is warm and comfy, while the single-piece orthopedic foam mattress supports her posture and joint comfort. Removable plastic hoop lets you fold the top layer back to help her get inside, or fold it down to make sure the blanket stays spread all the way to the edge for maximum coverage. Available in two colors; the 26-inch diameter bed is 3 inches thick and the 35-inch diameter bed is 3.5 inches thick. Machine wash cold separately. Non-chlorine bleach. Hang dry or tumble dry low. Foam core: Hand wash soiled areas using mild soap. Air dry. Do not soak or wring. Great for a sheet snuggler. Our dog is all about sleeping under our sheets at night. When we had out newborn and she wasn’t able to sleep with us any more this was a great subsatute. She is able to snuggle in the blankets and we know she is comfy and warm at the end of our bed. Only issue is that opening is a bit small for her to turn around and get comfy but with some assistance she is good. Love that that plastic tube is able to come out to wash, which is suuuper easy btw, and she uses the bed so much easier without the tube holding the blanket up. This wonderful bed, from the moment I saw it I knew it was something I had to get for my cat. She's getting up there in years, almost 10 now, and showing signs of body aches and pains. I had a nice cushy bed in mind, something to give her body that much needed support; and when I saw this bed, the way it's made,the faux sheepskin, and hood, specifically; with her being such a burrower and a lover of warmth, I knew this was the bed for her. When it first arrived, she wouldn't go near it for 3 days. I worried that I'd made a mistake; but after that, I can't seem to get her out of it. I'm so happy with my choice. Thanks so much for such a great product. It's well worth it. All the dogs love it. I bought this because my dachshund chews through beds to burrow in them. As soon as I opened it, I shoved him inside and he loved it! Started rolling around and wouldn't come out. All 3 of my days will cuddle inside. Its been a few weeks and it hasn't been destroyed. So that's a success. The only thing that made me give four stars was that the hard plastic opening keeps falling and poking out at the end. Our Maggie LOVES to burrow down under the covers in our bed. Unfortunately, I tend to overheat when shes does that. I was looking for a bed and this one is perfect. I did remove the plastic support so it lays flat at the opening. After holding it up a few times, she got the hang of just nosing her way under. There are some mornings I have to peel the blanket back to get her up because she doesn't want to come out :) She's approx 35 pounds and has plenty of room to stretch out inside. Our dog LOVES his bed! Our Basset Hound loves this bed! We bought it for him after realizing how much he loves snuggling in blankets and being covered. He chewed the plastic tube that held it open, and for a long time he would just lay on top of the blanket. He's finally figured it out now, and he spends hours snuggled in his bed with the blanket cover over him. He really seems to like it with the winter weather we've been having lately. It's filthy and needs a wash because he uses it constantly. It's hard to find the time when he isn't using it though. Ha. I bought the smaller size for my 16 lbs Shiba Inu, Matsuko. It didn't take her long to fall in love with this super soft bed. She has always been a burrower and usually sleeps under the blankets at night, so I had a feeling she would really like this bed. She loves sleeping on top of it as well as underneath the flap. We do not use the plastic tube it came with-- I had it inside the bed for a week and she refused to sleep in the bed, but once it was removed, she was drawn right back in like Pooh to a jar of honey. Fabulous bed at a great price. Can't beat the comfort and safe space it has given my favorite girl. I am still not sure about this product. I have a 10 month old Yorkie and he hasn't really been into beds much. This is a new experience and the fact there is a huge space in the back where if he gets in there he flips the whole thing over. We have a min pin that needs covers at all times. This bed is wonderful for him. The only complaint could be that it sheds the white fur but hopefully that will pass. We are ordering another one.